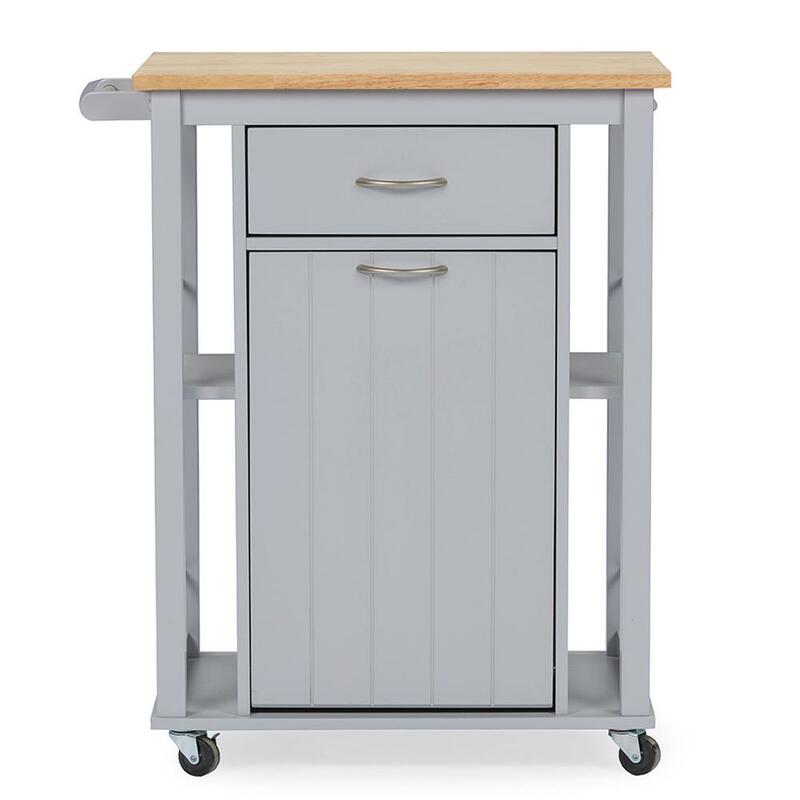 The Yonkers kitchen cart makes an extremely useful addition to any kitchen. Constructed with engineered wood and solid rubber wood, this portable kitchen cabinet incorporates a solid hardwood top. The kitchen cart's functional design incorporates a storage compartment for food scraps or other refuse. Plus, convenient nickel handles enable easy access to interior compartments. It took me a while to assemble it due to most parts were not labeled and all screws were mixed in one bag. For DIYers, I suggest you group screws and make sure you don't use the wrong screw. Most pre-drilled holes were precise except the ones for trash bin stoppers. After assembled it, the cart was a perfect fit for my kitchen. There were a couple of issues may be useful. The first one is that it has very strong smell of formaldehyde out of box. It came from panels made from MDF boards. On bottom panel of the cart it has stickers stating level of formaldehyde complies to California's standard. I had to move the cart near a door and blew a big fan on to it for an hour or so everyday for over a week. If you are allergic to formaldehyde, you may want to avoid this cart. The second issue is trash bin door closes hard. There is no dampening so you will hear hard knocking each time someone (kid) closes the trash bin door. I cut dense foam 3M tape and applied to three stoppers to soften the impact. FIY, I bought 7 gallon Highmark gray trash bin and it fits inside perfectly. You cannot drop the bin in with cart door installed. You will need to open and lift cart door out a few inches, put the trash bin in, and then reinsert the cart door back. JYW has not submitted any questions. Is the back of the cart finished with the gray color as well? What are the dimensions of the trash can that I need to buy so it will fit inside? 7 Gallons, 14 1/2"H x 10 1/2"D x 15 1/4"W fits perfectly. You will need to lift and pull the cart door out to drop the trash bin in the first time. You only need to do it once as long as you use a trash bag over the bin.